Coach Jim CotterJames E. Cotter, a beloved teacher, coach, guidance counselor, athletic director and administrator at Boston College High School whose 50-year tenure helped to shape the lives of thousands of the school’s students, died Tuesday after a long and public struggle with amyotrophic lateral sclerosis. He was 73 and died peacefully in his Quincy home with his family around him. Mr. Cotter’s forthright battle with ALS, the disease named after the New York Yankee legend Lou Gehrig, who succumbed to it in 1941, served as an inspiration to the BC High community and to his many friends and fans across the region. A native of Dorchester’s Savin Hill neighborhood, Mr. Cotter attended BC High from 1951-1955, beginning an association that would define his life and make him a role model and father figure for generations of students. “Caring, compassionate, generous, and devoted to helping others, Jim Cotter was everything we would ever hope a student at BC High would turn out to be,” said William Kemeza, president of Boston College High School. As head football coach for the BC High Eagles from 1964-2004, Cotter amassed a record of 236 wins, 145 losses and 17 ties that included two undefeated seasons and two Super Bowl victories. Six of his BC High players: Jim Rourke, Joe Nash, Bob Clasby, Steve Trapilo, Tim Bulman, and Paul Zakauskas, went on to play in the NFL. 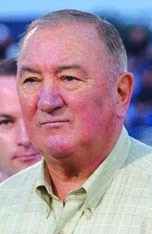 In recognition of his devoted service, his former players raised money to install lights at the football field in BC High’s Viola Stadium that bears his name, as well as for an endowed scholarship in his honor. It was, however, through his efforts off the field where he left his greatest mark. After graduating from BC High in 1955, Mr. Cotter accepted a football scholarship to play at Fordham University. When the school decided to drop the sport after his freshman year, he transferred to Boston College where he was a tight end and placekicker and had the distinction of kicking the first extra point in Alumni Stadium. He also played outfield and first base for the BC baseball team under Coach Eddie Pellegrini. He graduated with a degree in business administration and married his childhood sweetheart, Ann Grace, in 1959. The couple had three children: Grace, Kelly, and Michael, and settled in Weymouth. Mr. Cotter served in the US Army and then worked briefly as an insurance agent before accepting a job as history teacher and assistant football coach at the high school in 1960. He taught until 1972 when he was named a guidance counselor. He also served as director of athletics for a decade. He stepped down as guidance counselor in 2000 and served as special assistant to the president until the effects of ALS precluded any travel. A wake will be held at the Hunter-Fahey Commons at BC High on Morrissey Boulevard in Dorchester today from 4 p.m. to 8 p.m., followed by a Mass of Christian Burial at 10 a.m. on Friday, also at BC High. In lieu of flowers, donations can be made to the Cotter Scholarship Fund at BC High or to support ALS research and patient care through Compassionate Care ALS, the Angel Fund or the Norwell VNA Hospice. Boston College High School provided most of the material for this obituary.